So, it’s only February but this is a strong contender for the Science Story of 2018. 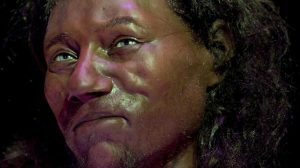 Cheddar Man, the skeleton of a 10,000 year old hunter-gatherer found in Cheddar Gorge, turns out not to be white. In fact, like other skeletons of the same age found across Europe, DNA testing shows he was brown or black – but had blue eyes. This was presented in the Channel Four documentary as utterly stunning and unexpected. Although three hunter-gatherer skeletons on continental Europe in the 10000-7000 year old range gave exactly the same findings in previous studies, so a bit of hype I think. About 10% of British DNA comes from these dark Mesolithic hunters. I could hear people falling off their barstools as I read the story. I’ve been in Cheddar several times, and I am now dreaming of the man and his family hunting reindeer and ‘they gurt* aurochs’ with dogs, looking up at the cliffs … my ancestor, with as much right to be here as anyone else. His people walked from what is now continental Europe, because there was a fertile land now drowned joining the gaps. British, European, Middle-Eastern, African, human. Scientists now think pale skin only came to the fore once farming begun, and palefaces benefited from higher vitamin D levels. Farming doesn’t feed you better than being a hunter, or keep you healthier, it just allows you to have more people, and take over. (Cheddar Man was lactose intolerant, which fits with not being a farmer.) It is interesting that although younger hunter-gatherer skeletons in Spain and Luxembourg come up with the same dark skin and blue eyes, the oldest German farmer found was pale skinned. I love how new scientific developments throw established wisdom into confusion. There’s almost no Italian DNA in the UK – so the Romans came, ruled for four centuries, and left without leaving a trace. (That chimes with the fact that Latin words came into English through the post-Roman civilisation. Can we assume that the Romans didn’t breed with or teach the locals much? **) On the other hand, DNA tests have shown that the Black Death was in fact the Black Death and not as some controversialists claim, something else. The real truth is hair, eye and skin colour are distinctive, but irrelevant for most purposes. We’re all related to each other. In fact, everyone is descended from most people alive in the Middle Ages. Many Europeans and Asians carry little bits of DNA from earlier versions of humanity than homo sapiens. The debate about race and racism is not really about facts, but here’s hoping this stunningly visual find opens people’s hearts and minds. *big. Of course I hear him talking in a West Country accent. **Sometimes genes just drift out of a population for no obvious reason.